There is a male voice that can read a book to me and his voice won't bore me. FINALLY. Liz Michalski, author of Evenfall, kept recommending the audio version of Neil Gaiman's The Graveyard Book but for some reason, I kept putting it off. Something else would pop up to distract me for a bit, or I would forget, but I finally downloaded and gave it a listen and now I'm in love with Neil Gaiman. Few authors can read their own works and provide distinctions between characters' voices and really do it justice, but Mr. Gaiman doesn't have that problem at all. His smooth and warm British voice is quite possibly the perfect voice to give life to The Graveyard Book. Nobody "Bod" Owens has lived his whole life in the graveyard. Well, almost his whole life. Right before he came to live there, he had a proper life with a proper family in a proper house, but he doesn't remember it at all. When The Man Jack came to visit one dark night, the only one in the family who survived The Man Jack's murders was the little boy, the toddler who crawled out of the house and somehow ended up in the graveyard. The Man Jack had missed him and left his job undone. The little boy is so little that he doesn't even know his own name. The ghosts in the graveyard convene to determine what should happen to him and Mr. and Mrs. Owens have decided to adopt him, which is a bit unusual considering they are ghosts and the little boy is quite human. Were it not for another ghost, Silas, who has access to the outside world, and who has agreed to be the little boy's guardian, the graveyard ghosts would not have granted permission for him to be raised there. The little boy will also have access to the graveyard, which includes learning how to do a few things that only ghosts can do. And so Mr. and Mrs. Owens adopt the little boy and raise little Nobody "Bod" Owens as their own. I'm not sure if it was Neil Gaiman's voice or the story, or maybe a combination of both that pulled me right in. I loved it. It was sweet, adventurous, dark, and suspenseful. The characters were remarkable and even though I was supposed to dislike The Man Jack, I even found him unique and intriguing. Neil Gaiman was undoubtedly the only possible choice to voice this story, and he did such an effective job distinguishing between Bod's younger voice and his friend Scarlett's, Silas' all-knowing and assured adult voice, along with the evil ghouls and all the other ghosts that Bod would encounter throughout his life while living in the graveyard. This inventive and quirky story is meaningful and fun, and I enjoyed every bit of it. I highly recommend this middle grade book in audio format, and in fact, would even suggest that you select this versus the printed version. It really is quite the lovely tale to listen to, and if I could paint the perfect evening for you to listen to this, I would suggest a cold and rainy night, preferably in the fall. You should be sitting by the fire, cozy in a blanket, drinking a cup of hot chocolate. Audio Sample: Click here to listen to the five minute sample on audible.com. I'm pretty sure you'll want to pick up the audio after listening to Neil Gaiman's voice. He is the author of such works as Coraline, The Graveyard Book, Stardust, and American Gods, which the 10th anniversary edition has just been released in the U.S. He lives in Minneapolis, MN. Did I miss your review? Let me know so I can add it. Gaiman is just off the path of normal, and in the case of this book, it is wonderful. I actually read this book out loud to my kids and we all loved it. 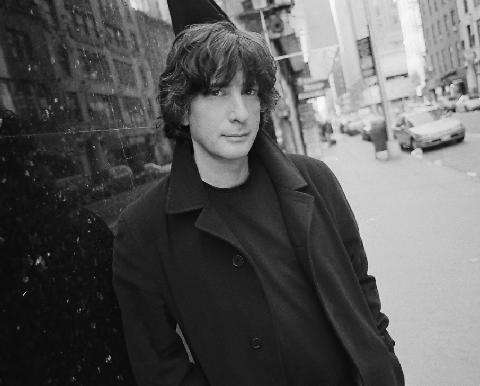 Although Gaiman normally narrates all his own books, he did not narrate Anansi Boys. That one is narrated by a guy named Lenny Henry who is jaw-dropping. I wasn't thrilled with the story overall, but that narration is what audio is ALL ABOUT. I think I'm definitely going to listen to anything Neil Gaiman has narrated. I loved everything about his voice; he's going in my Best Narrator (well, I don't have this formally set up, it's just all in my head) category, right next to Cassandra Campbell! Awesome. I love a great audiobook. I haven't read this one yet, so I will have to opt for the audio version. Thanks for the recommendation. I think you'll really enjoy it, I can't wait to read what you think of it! I'm so glad you liked it! Stardust is another one of my favorite audio books, and it is also written and read by Neil Gaiman. Yes, thank you, Liz! Finally, FINALLY, I listened to it! I won't take that long next time, I promise. I bought this one for my kids when I started reading all the great reviews of it all over the place, and need to grab it back from them to read it myself, though the audio does sound impressive. I like the synopsis of this story, and am curious to find out how it all works out. Great review today, Natalie! I am glad you enjoyed it, and I hope that I do too! Oh, I can't wait to see what you think of it! I would highly recommend the audio experience; Neil Gaiman is just perfect. I adored this one too! I agree with Sandy on Anansi Boys as well. The audio version is fantastic! I read this with my class of ten and eleven year olds and they just loved it and were so disappointed when we finished it. Gaiman has a wonderful quirkiness about his story ideas. That sounds like it would have been an amazing experience to read with the age group it was intended for. I am hoping that my niece and nephew pick this one up soon! This is how I felt about Coraline. It was my first NG and I tried it on audio. His voice is so good and enrapturing, I became convinced that any NG story I try should be tried as an audio. Great review. Yes! Coraline is on my list! I read the book with eyeballs but I've listened to Gaiman reading his work online and now I'm thinking perhaps I should give this one a go. He is an absolutely brilliant narrator and anything is a good excuse to listen to that accent. He really is a brilliant narrator; you can't go wrong with him! :) This would be a great option for Booking Mama's Kid Konnection! Wonderful review! I too listened to the audio of this book and thoroughly enjoyed it! And oh my, can you believe Kathy has an autographed copy?! I have been meaning to read this one!! I need to, most of my trusted bloggers love it. Oh, you should! There are a ton of quotes that I loved from it. It was just a perfect story. Wow! 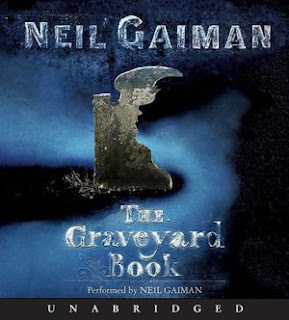 I just listened to the audio sample and fell in love with Gaiman's voice! I read the printed version of the book, but am very tempted to listen to the audio for a reread. I have a feeling I'll enjoy it better than I originally did. Here's a link to my review. Neil Gaiman also read each chapter during the book tour, and he compiled it in a series of videos on his website (the one he has for children, www.mousecircus.com -- I promise I'm not spamming!). It's worth checking out. I just listened to the audio sample, and while I'm not usually a big fan of audiobooks, I'm seriously considering getting this one. I've heard multiple bloggers now talking about how perfect his voice is for his audiobooks, and having listened for a bit I tend to agree. The Graveyard Book has been on my to-read list for forever, but I hadn't ever gotten around to reading it. However, I just finished reading and reviewing the author-preferred text of American Gods (my first Gaiman book), and I think I'm hooked. Despite the fact that they're written for a very different demographic, I can't wait to read (and/or listen to) this one as well!